The crew of the Enterprise finds itself exploring a "temporal disturbance" near an unknown planet. After accidentally injecting himself with "super adrenaline" McCoy loses his mind and beams to the planet where he finds a portal in time. 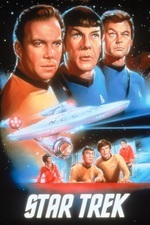 Kirk and Spock must travel into the past in order to prevent a deranged McCoy from altering history... and eradicating their own past. "The City on the Edge of Forever" is episode #28, production #28, first broadcast on April 6, 1967. It was repeated on August 31, 1967 and marked the last time that NBC telecast an episode of the series on Thursday nights. It was one of the most critically acclaimed episodes of the series and was awarded the 1968 Hugo Award for Best Dramatic Presentation. The only other episode with such an honor is the two-part episode "The Menagerie". The teleplay is credited to Harlan Ellison, but was also largely rewritten by several authors before filming. The filming was directed by Joseph Pevney. Joan Collins guest starred as Edith Keeler. The episode also inspired a run of comics inspired by the original Harlan Ellison teleplay.